You asked, we listened! 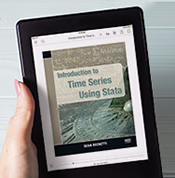 Stata Press eBooks are now on Kindle. Add notes, highlights, and bookmarks as you read, and more. A link to purchase the Kindle edition of a Stata Press eBook is provided on the book's page. Order today!